Welcome to our 6th annual Scarecrow Row! Sponsor a scarecrow and advertise your company! Your scarecrow and sign featuring your logo will be displayed on Scarecrow Row facing Livernois and Wattles Roads for the month of October. $200 and $250 sponsorships available. New this year, for $700, you can purchase a 3-year sponsorship which includes everything that a $250 sponsorship offers for a discounted rate.Contact tcollins@thvmail.org for details. Click here to download a commitment form. Not a business but still want to get in on the scarecrow fun? These scarecrows are a great way to support the Village and show your school spirit. College ‘crows decked out in spirit-wear from your favorite schools will be installed inside the Village for the month of October on the Scarecrow Gridiron. 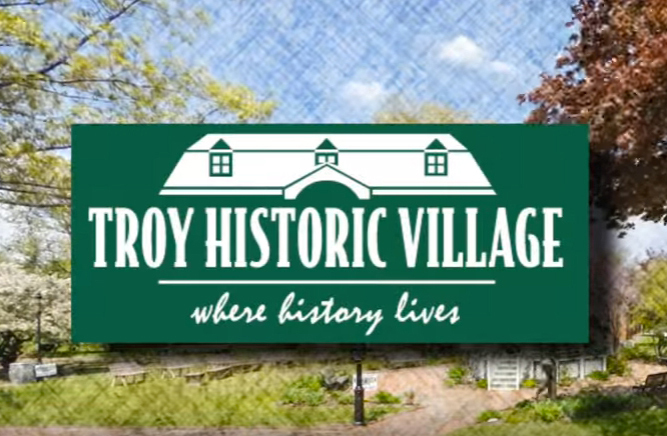 College ‘crows will each be accompanied by a sign with the name of the family or families who sponsored it so everyone can see that you support your school AND the Troy Historic Village. It’s a great Fall activity for you and your “team”. $200 and $250 sponsorships available. Contact tcollins@thvmail.org for details. This event repeats every 1 days, starting from October 1, 2019 until October 31, 2019.